Hi! 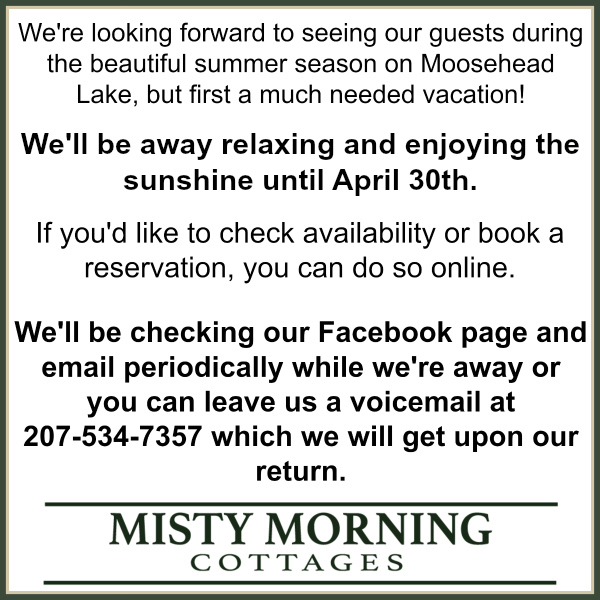 We have our rates listed here –> http://mistymorningcottages.com/rates/. We do not have the restaurant running right now, it just wasn’t feasible to get that running because our purchase didn’t go through until the last week of November. Very clean, rustic cottages with full kitchen are just feet from Moose Head Lake shoreline. Every day started with the “misty morning” they are named for. Loons called the evening in and mama Mallards with their ducklings cruised past during the day. Beautiful setting and nice hosts. I would absolutely recommend.